I love when random, unplanned and experimental recipes turn into successes. That’s what happened with this garlic butter noodles with turkey and broccoli. I needed to make a quick dinner because it was getting late, but wasn’t hungry for some of our go-to meals, like spaghetti. I only had ground meat in the fridge and had everything to make sauce, but really wasn’t in the mood for tomato flavors. Alternatively, butter and garlic sounded good, but then again, when does that combination not sound delicious? It’s a classic. Plus, I hadn’t eaten much butter on this particular day, so it was time to change that! Butter makes most everything better! Heat a large pan over medium heat and add the ground turkey. If necessary, add a little fat to the pan. Break up the turkey with a spatula and let cook for a couple minutes. Next, add three of the minced garlic cloves and the broccoli. Season to taste with sea salt and pepper. Continue to cook for several minutes, until meat is browned. Once meat is cooked through, pour mixture into a bowl and set aside. In the same pan, melt the butter over medium heat. Add the one remaining clove of minced garlic and saute for about 30 seconds, or until fragrant. 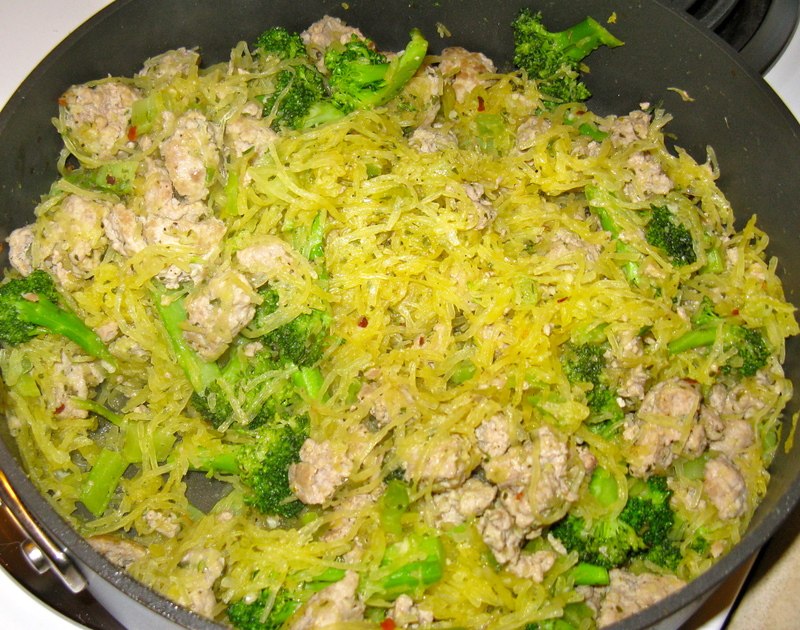 Reduce heat to low, and add the spaghetti squash strands, tossing with the butter and garlic. Add the meat and broccoli mixture to the pan and toss with the squash. Season to taste with more sea salt and pepper, if needed. Add red pepper flakes, if using. Cut spaghetti squash in half lengthwise and scoop out the seeds. Place cut side down on a baking sheet or roasting pan, and fill with about 1/4-inch of water. Bake in oven for 30-35 minutes. Be careful not to overcook or your strands will be mushy. Let cool and then scrape out the squash strands with a fork. I loovee spag squash. I haven’t had it in a while, I should snag one before they disappear! I know, I’m trying to take advantage of them too while they’re still around. They’re already getting harder to find! Ok, that’s it! 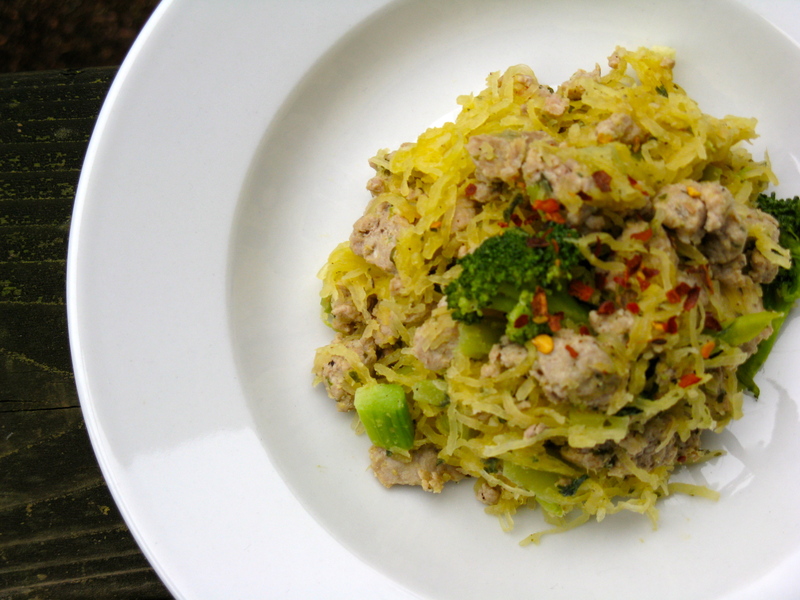 I have to try spaghetti squash! 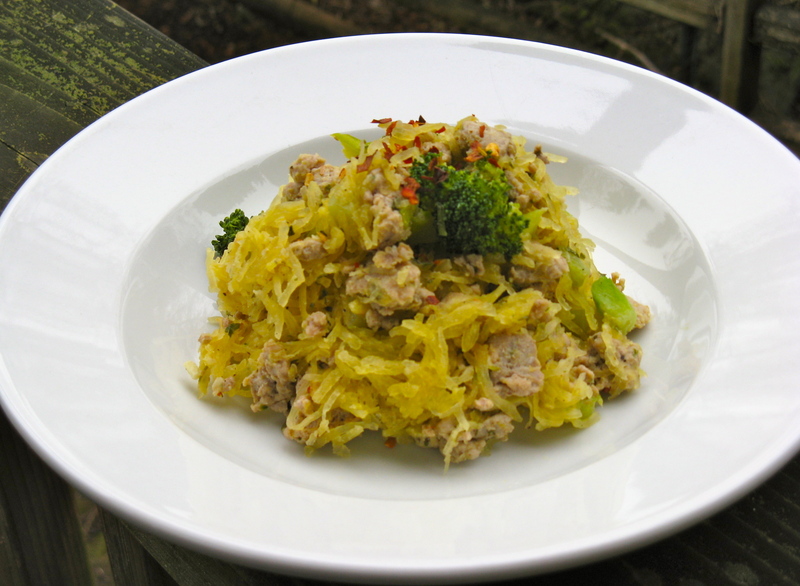 You’ve never tried spaghetti squash? Yes, you must try it then! LOL, I know, right? I’m going to be trying lots of new things on my quest for optimal health. Well, you can’t leave spaghetti squash left out if you’ve tried all the others 😉 I hope you enjoy it! I have been searching high & low here in Australia for spaghetti squash & cannot get it anywhere 🙁 Is it a winter veggie? I might have to start my search again when it cools down here? Yes, it is a winter veggie. The stock is winding down here, so I’m trying to take advantage of it while I can, along with other winter squashes. The Boy and I just discovered spaghetti squash last week. OHMYGOD. I love it! We’ll have to try this recipe, especially since I just found a place selling spaghetti squash for $0.39 a pound less than Freddy’s!